Johannes Brahms has been my favourite composer for years. Brahms's music is unusual in its beauty and depth. 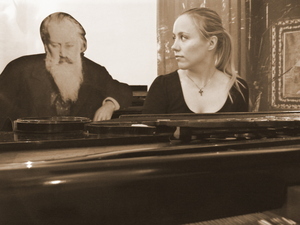 Playing Brahms is a wonderful, emotionally touching and interesting experience. There are so many interpretive choices to consider. I would even say playing Brahms is one of the best things in my life. Here you can read more about some of my Brahms projects. Photo 1: At the Brahms's museum in Mürzzuschlag, Austria.